The spirited hosts, who had lost 11 of their last 12, never gave up and finally got their reward in the third minute of added time in the second half when Kolasinac turned Adama Diakhaby’s shot into his own goal, but it was not enough to stop Arsenal pulling back within a point of fourth-placed Manchester United. Arsenal arrived looking to arrest a run of three away defeats in a row, but found Diakhaby’s raw pace in behind Kolasinac tough to deal with early on. The familiar problem of a poor final ball still dogged the hosts however, and instead Arsenal went ahead with their first real chance when Kolasinac’s excellent cross was met on the half-volley by Iwobi, but a deflection off Kongolo wrong-footed Hamer who could only push the ball inside the side netting. 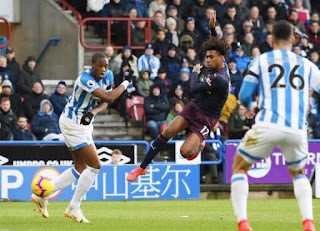 After the break Huddersfield looked more dangerous but were close to getting caught out again as they committed men forward, with Iwobi denied by the onrushing Hamer and Christopher Schindler’s excellent challenge stopping Lacazette from scoring his second. At the other end, Diakhaby forced smart saves from Bernd Leno with two efforts from the edge of the area and substitute Erik Durm’s cross was deflected onto the bar.